The Kernos Centre has long been endeavouring to supplement the gaps in the statutory provision for counselling for local children and young people who are struggling with emotional and psychological problems. Unfortunately, the ever-increasing need for this service in Sudbury and surrounding area is so great that some youngsters were having to wait for up to six months to see a counsellor. Now, however, vulnerable local children and young people will be able to access appropriate help from Kernos far more quickly, thanks to a £10,000 grant from the Children & Young People’s Emotional Health and Wellbeing Fund. This was developed by West Suffolk and Ipswich and East Clinical Commissioning Groups, along with Suffolk County Council, and is managed by the Suffolk Community Foundation. The Kernos Centre’s application for the grant was supported by South Suffolk MP James Cartlidge and the award of this much-needed funding will help to pay for more than 500 counselling sessions. These provide a safe, non-judgemental opportunity for young people to talk about and process difficult life situations, build resourcefulness and make positive changes in their lives. Chris Boatwright, Clinical Director of Kernos, is clear: “Early intervention is key to preventing psychological problems which can affect the life chances of children and young people but, because we currently have so many young people waiting for help, we were getting into a position where we thought we would have to close our referrals list. James Cartlidge, who is a member of the All-Party Parliamentary Group on Mental Health that is currently taking evidence from the many local and national organisations dealing with mental health issues, said he was “delighted” to hear the news that Kernos had been successful in applying for a grant to support its valuable work. 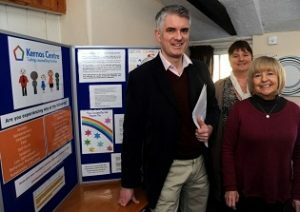 Picture shows: South Suffolk MP James Cartlidge with Kernos Centre Counsellor Sara Jackson (centre) and Clinical Director Chris Boatwright.